As usual, it’s very good and entertaining to read the article from the author’s personal experience. We think that from the perspective of clinical vision and a way of delivering important practical information, Mr. Nelson is one of the best authors who writes on the clinical aspects of massage therapy. Unlike other educators, he understands and correctly presents the science of somatic rehabilitation, avoiding a very popular, but unfortunate, fragmentation of the profession. A very good review of Golgi Tendon Organ receptors, their anatomy, function and role in body-work. The main topic of this issue of Massage&Bodywork Magazine is Sports Massage and these two articles give readers an overview of where US Sports Massage is and the direction of its future development. The articles give readers who are interested in Sports Massage some valuable resources. A pain free therapist is a key element of professional success. This article covers some important aspects of injury and overuse prevention. However, it misses equally important components for a pain free practice: correct engagement of the body weight into each stroke and the necessity of contact with the table, feet position, etc. The recommendation to always look straight while working with the client is simply wrong since it increases isometric work by the posterior cervical muscles and additionally increases cervical lordosis. These two factors eventually affect the distribution of pressure through the disk and are main contributors to cervical disks pathology. If the therapist wants to concentrate on the palpation, which is one of the reasons for this strange recommendation, he or she should simply close his/her eyes. To avoid cervical tension the therapist should avoid the static position of the head and neck and engage the muscles into isotonic contractions, which is the best way to avoid cervical pain and tension. The steps discussed in this article are helpful. However, the author misses the most critical one and without addressing it all other steps are just patching the problem of non-returning clients. A very good article on Cubital Tunnel Syndrome with necessary anatomy and pathophysiology explanations. The article becomes much less informative when it gets to massage therapy’s treatment options. The general approach is correct but it still doesn’t have enough clinical teeth, which the therapist can apply after reading the article. A short but very good and informative article on Carpal Tunnel. This article and the article written by Mr. Lowe on Cubital Tunnel Syndrome are dedicated to the nerve compression syndromes but the difference between them is striking since instead of the general guidelines offered by Mr. Lowe, Mr. Dalton gives therapists actual tools they can immediately add to the treatment plan. This article is dedicated to the Iliotibial Band and it correctly covers its anatomy and pathophysiology of the Syndrome associated with it. It also describes so-called Iliotibial Tract Technique to address tension in the iliotibial band. The technique described in the article under such a special name is actually the application of frictions known since Roman times when Galen used them to work on iliotibial bands of gladiators in the Perham School where he worked as a physician. Why the author re-named millennium old it is known only to him. Yes, friction is a very important part of the treatment session. However, this is not nearly enough to reduce tension in this powerful connective tissue structure. On top of that the article missed a critical point of the therapy: if the therapist doesn’t address the tensor fascia lata muscle FIRST and work on iliotibial band itself he or she wastes a lot of time and effort. A good article on a potential player in hip pain. This article is dedicated to Chronic Pelvic Pain, which a very difficult condition to deal with. The author mentions the most common causes and traditional treatment options. The article is written for massage therapists and it is supposed to give readers some practical tips and recommendations what to do. Otherwise, it loses its clinical value. Unfortunately this is the weakest part of the article. In regard to CPP from a massage therapy perspective, to help these patients the therapist has to have enough expertise to examine soft tissue on the presence of reflex zones formed in the skin, fascia, skeletal muscle and periosteum developed secondarily to Chronic Pelvic Pain. If these reflex zones are present they act as an additional driving force of the entire clinical picture and only Medical Massage therapy can detect and efficiently eliminate them, removing the somatic component of Chronic Pelvic Pain. A good article which overviews the anatomy and physiology of respiration. In the article a very helpful technique of breathing facilitation is discussed but unfortunately, it isn’t presented accurately. First of all, the therapist must be positioned above the chest with both hands equally positioned on the chest. In the article the therapist is positioned on the side of the table and it creates unequal distribution of counter-resistance during active inhalation. Also, the therapist should spread fingers and place each finger into intercostal space. Massage Therapy must be a part of the treatment strategy for each patient who suffers from Parkinson’s Disease. This article provides some scientific data on this subject and therapists can use these references to help their patients and build up their practices. A very good article on the basic principles of cupping as part of Chinese Medicine. We still think that cupping using silicone jars is more defensive to the tissues. We like this approach better, especially for massage therapists, since the author uses silicone jars and besides working along the meridians, he recommends cupping to work on the skin and fascia, enlarging the therapist’s tool box. Another good piece on cupping and its application in the clinical setting. A very informative article on the thoracic spine and its kyphotic deformation. An excellent article on a very important subject. A highly suggested article to read. 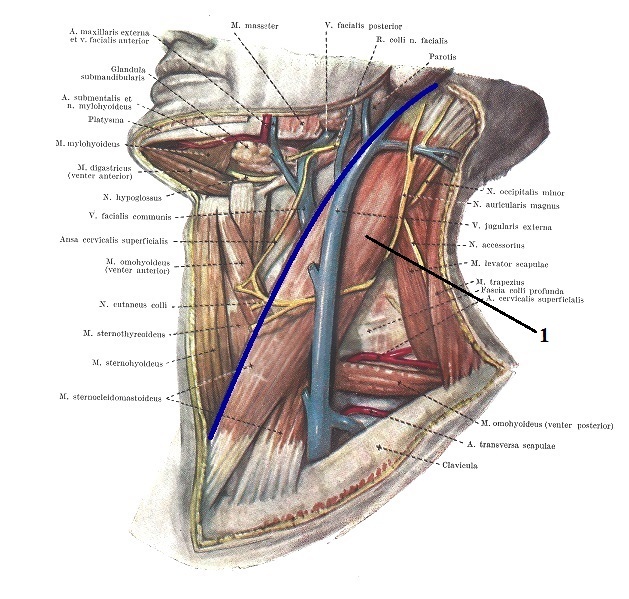 Everything that is said in this article about the sternocleidomastoid (SCM) muscle is correct. However, the article becomes a complete disaster when so called SCM Differentiation Technique is described. If massage publications or articles start to discuss the medical aspects of massage therapy, the rules of medicine must ALWAYS be followed. It seems to us that very frequently the authors think they have some special knowledge while they simply define even basic rules of medicine, claiming to be part of it. This article is an excellent illustration of this very unfortunate phenomenon, which is unique to the massage profession since disregarding even such basic sciences as anatomy and physiology would never be tolerated in any medical publication. “I am pretty far forward off the carotid artery” (while the author’s hand position indicates that his fingertips were on it). If it feels like it’s dumping I don’t poke it” (this is our ‘favorite’ description). Instead of asking Mr. Luchau about the carotid artery the student should ask him about the carotid sinus. The position of the client (on a side), grabbing the SCM with four fingers in front of its medial edge while additionally asking the client to rotate the neck (see Fig. 2) – all of that places the author’s fingers against the carotid sinus. Carotid sinus can be massaged but it is a medical procedure which is frequently performed by physicians in the emergency room to restore heart rate in cases of tachyarrhythmias. It is done while the patient is hooked to an ECG and with all necessary medical monitoring available in case the heart rate drops abruptly. The carotid sinus itself is the dilated part of the internal carotid artery just above the split of the common carotid artery into internal and external and just under the SCM. The walls of the carotid sinus contain a large number of baroreceptors which when stimulated slow the heart rate and decrease blood pressure, sometimes suddenly. Let us illustrate to our readers the power of Carotid Sinus Massage and the high vulnerability of the area where the article suggests to apply SCM Differentiation Technique. Fig. 1 below illustrates the ECG of the patient with severe QRS Tachycardia or high cardiac rate before “a” and after “b” application of Carotid Sinus Massage. Please compare the length of red bars on the left side of the ECG (very high cardiac rate before application of Carotid Sinus Massage) to the length of blue bars on the right side of the ECG (restoration of normal cardiac rate and normal distance between cardiac contractions). You can see that even very short application of pressure in the area of carotid sinus, without any medications, immediately drops heart rate and restores normal ECG in cases of severe Tachycardia. This is why work in the area of the carotid sinus on patients with normal cardiac rate should be completely avoided. Now we would like the readers make their own conclusion based on the facts from the article and our comments. Fig. 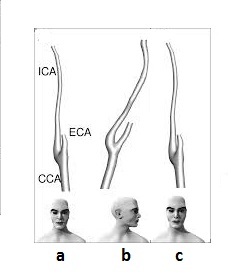 2-4 illustrate the anatomy of the carotid artery and its relations with the SCM. As the reader can see below, the carotid sinus is located in front of the medial edge of the SCM. Let’s now recreate application of the SCM Differentiation Technique from the original article. 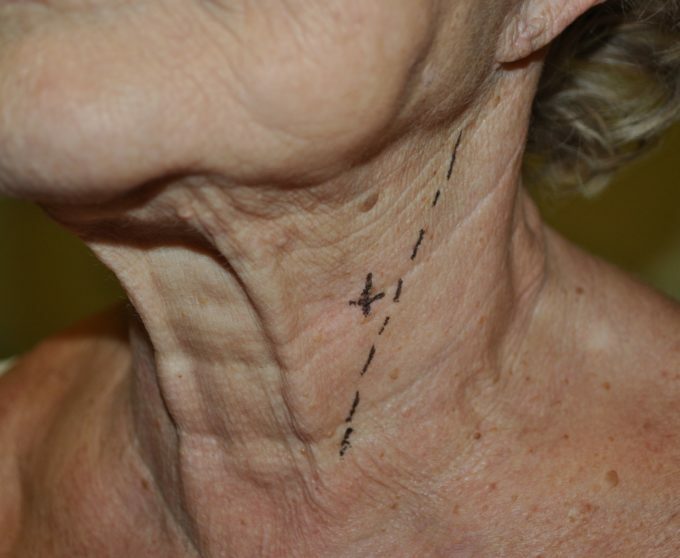 As suggested by the author the therapist should grab the SCM muscle and anchor it while asking the client to rotate the neck to one side and then to the other. The video below illustrates the initial hand placement on the right SCM and subsequent rotation of the head to the right in this scenario. Notice where the position of cross mark (i.e., carotid sinus) is in regard to fingertips. Thus during the head rotation to the right the fingertips of the 2nd -5th fingers will go deeper behind the SCM and this can’t be avoided if the therapist wants to anchor the SCM. We presented above Mr. Luchau’s exchange with a student about the carotid artery. We would like to inform the author that one doesn’t need to ‘poke’ the carotid sinus to stimulate it. The position and pressure he used in the video already puts the carotid sinus into the risk of stimulation by eliciting pressure on the soft tissues which in turn will stimulate the carotid sinus. This may lead to a sudden drop in the heart rate and arterial blood pressure. However, the head rotation suggested as a final part of the treatment adds an additional dangerous twist to already bad therapy promoted in the article. Fig. 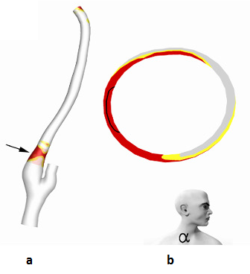 4 illustrates the change in position of the right carotid sinus when the head is turned to the left, as detected by MRI (Callaghan et al., 2011). Readers may see a difference in the shape of the carotid sinus detected by MRI and it caused only by the simple head’s rotation: ‘a’ and ‘c’ – the subject looked straight and ‘b’ – the head was rotated to the left. Adding pressure to the carotid sinus while head is rotated might stimulate the baroreceptors which in turn may rigger havoc in cardiac function. As it was also shown by Callaghan et al, (2011), head rotation in combination with pressure significantly increase stress on the wall of the distal part of the carotid sinus which in turn may be a contributing factor to purely understood Spontaneous Carotid Artery Dissection. Should we mention that this is a gravely dangerous situation? Fig. 5 illustrates this find. On the left the reader can see the MRI image of the right carotid sinus with stress on its medial wall indicated by the red color and black arrow (a). On the right the reader can see head rotation to the left and a cross section of the carotid artery with the same stress on the wall indicated by the red color (b). Fig. 5. MRI results indicate distribution of the stress through the wall of the carotid sinus while the head is rotated to the left (Callaghan et al., 2011). However, even this is not all. If an older patient suffers from plaque buildup in the carotid artery, which is very common situation, the massage strokes recommended in the article may detach part of the plaque and cause Transient Ischemic Attack or Stroke. Transient Ischemic Attack or Stroke (Richardson et al., 2000; Adlington and Cumberbatch, 2009), Ventricular Fibrillation (Deepak et al., 2005) even resulted in patient’s death (Alexander and Ping, 1966), pyramidal muscle weakness and visual filed defects (Munro, et al., 1994; Richardson Chardson et al., 2000). This why ANY work on the anterior neck in front of the medial edge of the SCM must be done after the patient’s physician is informed. He or she will listen to the carotid bruit and maybe do Carotid Doppler and only after these basic procedures are done and with patient’s consent to the therapy, the therapist can do work suggested in the article. However, SCM Differentiation Technique isn’t even needed since the SCM is a superficial muscle and can be easily worked on by using other much more effective and safer means. We received validation that the article is dead wrong during a video session we recorded with our patient who agreed to be the model. Before video recording we told her that she must inform us if she feels any discomfort. At the end of the rotation to the right part of SCM Differentiation Technique suggested by the article our patient, who is an older lady, reported lightheadedness and we immediacy stopped its application. To conclude: It doesn’t matter who said what. 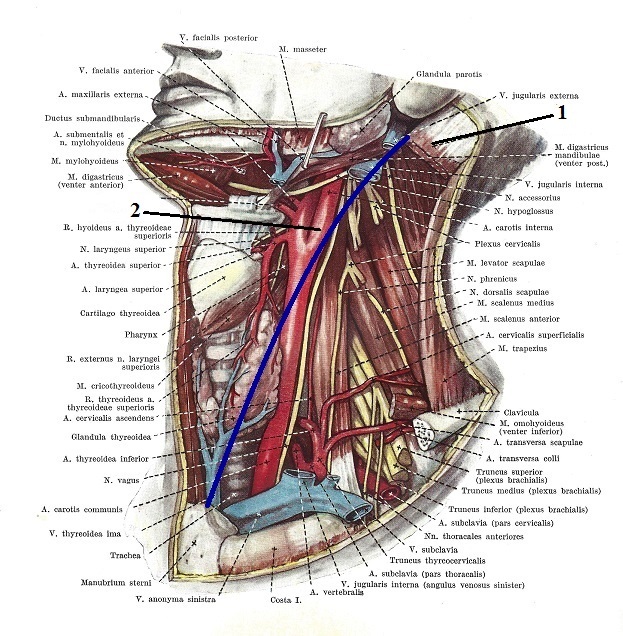 Therapists don’t have the right to work in front and under the medial edge of the SCM on the level of larynx since this is a direct danger zone. It is simply sad to observe that the same author can produce very informative and helpful articles while in other cases demonstrate a complete disregard of medical science and sometimes even manipulate the scientific data to support unscientific claims. Munro NC, McIntosh S, Lawson J, Morley CA, Sutton R, Kenny RA. Incidence of complications after carotid sinus massage in older patients with syncope. J Am Geriart Soc. 1994 Dec; 42(12):1248-51. There is a lot of correct information in this article, while some data is just the author’s personal speculation presented as validated by science. However, the article correctly describes the issue of Paradoxical Breathing and emphasizes the role MT plays in its normalization. This article illustrates the clinical importance of fascial work on the example of pain associated with a traumatized biceps brachii muscle. The article raises the important subject of Trigeminal Nerve Neuralgia. Treatment of this condition is an uphill battle for everyone from neurologist to therapist. MT plays a supportive but important role and can’t normalize the function alone. Only integrative therapy may help patients but unfortunately for some, there is very little that can be done. What is unique about Dr. Chaitow’s articles is their distinctive perspective. Frequently the author raises topics no one else has addressed. This article is a great example of it since Dr. Chaitow covers the issue of clinically sound dosage of therapy. A majority of therapists work from the perspective of 30 min, hour, hour and a half sessions while in reality the dosage of the therapy is governed by only one thing – what the patient actually needs. The tissues can be undertreated or overworked. Thus the treatment’s duration, breaks between sessions or in other words treatment dosage is a critically important component of somatic rehabilitation. This is an excellent piece which shines a light on MT from an unexpected perspective. The author shares results of a study which confirmed that Infant Massage increases bonding with mothers who are incarcerated to the degree that recidivism of crime among these inmates falls significantly. Upon first look it sounds fine and to some degree is even correct. Of course, incorrect posture or work ergonomics are contributing factors to disk pathologies. However, Mr. McCann continues to miss in his barrage of articles the simple fact which the ‘medical profession’ understands but he doesn’t want to. If a patient already has a bulged or herniated disk, postural changes which initially may contribute to that now lose their treatment priority. The brain will do whatever it takes to protect the spinal nerve(s) from any potential damage. The brain does that by changing or additionally altering body mechanics, posture, gait, etc. Thus the first treatment goal must be unloading pressure on the affected disk(s). Instead the author suggests changing body mechanics and postural changes while the patient is still in pain. Ironically, the therapy Mr. McCann suggests is a very helpful tool, but it must be used later when the compromised disk is unloaded and functional balance, if present, is restored. What is really troubling in all of Mr. McCann’s publications is the complete absence of practical information. It is nearly impossible to review what Mr. McCann actually does since he never gives any details. Each article is a standard set of complaints about the ‘stupidity’ of traditional medicine which doesn’t want to consider Mr. McCann’s proposal as the ultimate solution to the entirety of somatic rehabilitation (he actually said that). He offers a general description of random cases he miraculously healed and general statements about the uniqueness of his method. Nothing else. It is excellent deal for the author since without any substance he regularly uses Massage Today as free advertising tool. This article covers two muscles: flexor carpi ulnaris and extensor carpi ulnaris and two common pathologies of the elbow joint associated with them: Golfer’s Elbow and Tennis Elbow. The article correctly presents anatomy, pathophysiology and basic assessment. However, it has two major flaws. First of all, the article fails to mention that tension or injury of these muscles will always trigger the formation of periostal trigger points at the insertion of tendons into the medial or lateral epicondyle. In many clinical cases these trigger points are even the initial cause of muscle tension in the affected muscles. In such cases the treatment strategy changes. The second problem we see with this article is the treatment options which are mentioned. Yes, friction is a very important tool but without work on the fascia with various kneading techniques, without resetting muscle spindle receptors and restoring the anatomical length of the affected muscles, without targeting the periosteum itself, friction alone is not enough. Another treatment mentioned in the article is stretchings, which need to be done very carefully with the stabilization of the insertion otherwise they will ruin the entire treatment done before. Finally, exercise mentioned in the article should not be a treatment option combined with MT. Light repetitive exercise are completely contraindicated if periostal trigger points are active and they are usually present. Exercise can be used only after even the residuals of inflammation are eliminated. A good introductory review on Taping. This therapy can be a very helpful tool in some clinical cases. Finally the author has turned to science and uses correct terminology and understanding of what actually happens into the connective tissue when tension develops there. This is great news and we hope the author’s previous notions about cholesterol deposit and hide glue-like changes in the fascia are causes of tension in fascia are gone forever and the author from now on will rely on scientific data and references. This article is on a very important subject but it has very limited presentation and doesn’t carry a lot of practical info. In defense of the author, who usually writes very interesting articles in Massage & Bodywork Magazine, this format of article more likely was dictated by the Editorial Board of Massage Magazine. They would like their publication to be a source of easy reading and professional info sharing, rather than a vehicle for a lot of educational content. In this article readers are not going to learn about these muscles’ anatomy, function or tension pattern. However, we consider the article an important piece since it puts a spotlight on the very disturbing practice when therapists or the place where they work start to restrict application of massage therapy in thoracic, gluteal and abdominal areas and still call it full body massage. There is nothing ‘full’ about it and therapists can’t balance the activity of the sympathetic and parasympathetic nervous system by avoiding parts of the body with such large soft tissue mass. The author is also correct when she traces the root of this problem all way to the massage schools which, with rare exceptions, equip students with a very limited technical arsenal and then cut major parts of the body out of full body massage sessions. Eventually this practice will affect the number of clients who are using massage therapy as a preventive measure. A very good article which covers testing of the ROM in the hip joint. Finally someone has the guts to clearly say that deep tissue massage isn’t the senseless application of deep pressure, sometimes to the screaming point. Such ‘therapy’ is a sign of professional incompetence. We may add that there is no such independent modality as Deep Tissue Massage. Despite its title this article has nothing to do with Medical Massage. It actually covers the application of stress reduction/therapeutic massage in the medical setting. This modality is a critically important tool of preventive medicine but it doesn’t have the clinical teeth to deliver stable results. This article is an example of the long and to this point fruitless discussion within the US massage community about the definition of what Medical Massage is. The author of this article presents the view that massage therapy conducted in the medical setting makes it Medical Massage. Another school of thought sees this assumption as near sighted and incorrect since Medical Massage is a special medical procedure which targets various pathological abnormalities in the soft tissues or inner organs with specially designed treatment strategies. The correctly trained therapist can adjust and alter them according to the individual clinical picture presented by the client. We definitely support this second group and see an article like this as misleading and a misrepresentation of such an exciting part of the massage profession as Medical Massage. This is a very important piece of information since it educates therapists in the early signs of skin cancer. Clients see themselves every day and some areas of their body they can’t see at all. If the client lives alone and rarely goes to the doctor, the only person who might see the area where early skin cancer has already formed is the therapist who works on him or her. Knowing what to look for may make a therapist a life saver for the client because he or she can suggest to the client to get examined by a dermatologist. The article is helpfully illustrated with basic necessary pictures of different forms of skin cancer. A great article which reviews major pathological conditions associated with skin. We think it is an excellent educational piece for therapists.